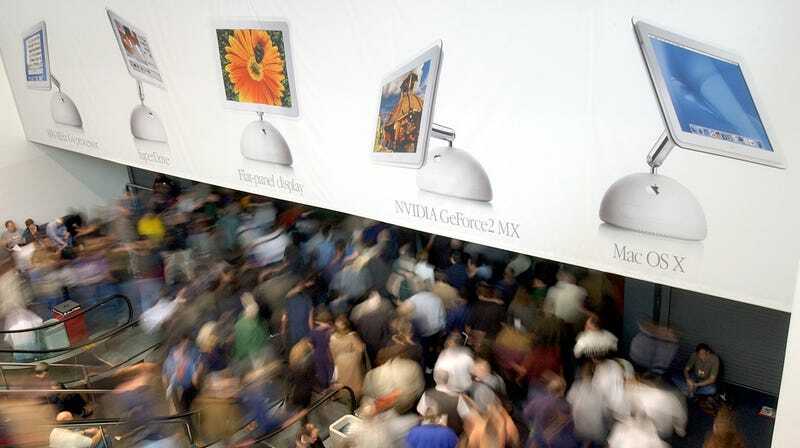 Attendees enter the Macworld Expo in San Francisco on January 8, 2002. On Wednesday, Tim Cook issued a dire, surprising, and historic warning to his company’s investors. Apple, the world’s first trillion dollar company, would be lowering its revenue forecast for the first time since 2002, thanks in part to bad iPhone sales and China (basically). But wait, you’re thinking, what the hell happened in 2002? And that’s all Jobs said at the time. As John Gruber points out, the entire Apple statement, including that Jobs quote, clocks in at less than 200 words and can be summed up as: Numbers look bad, but Apple’s about to blow your mind with some new stuff. Tim Cook’s letter to investors on Wednesday is around 1,400 words and noticeably lacks that charismatic call-to-action around exciting new Apple products on the horizon. The closest thing we get to that is a funny line about how the company is going to make it easier to trade-in new iPhones in some winking effort at suggesting that the Apple’s aging cash cow hasn’t completely lost its way. Back in 2002, the iPhone obviously didn’t exist, and Apple was still furiously begging consumers to take its computers seriously. It was an incredibly interesting time. The first iPod had hit the market in October 2001, and at the Macworld Expo the following January, a beaming Steve Jobs revealed the iMac G4. You know, the one with the 15-inch LCD floating on a chrome arm connected to a compact white base with a shiny Apple logo on the front. The crowd gasped when Jobs did the big reveal. Then that earnings panic happened, and to be sure, Apple stock took a hit. By the end of 2002, you could buy a share of the company for $14.33, a near 40-percent drop from the beginning of the year. This actually would have been an amazing time to buy Apple stock, because things turned around for Steve and friends after that. In April of 2003, Apple released the iconic third-generation iPod and launched the iTunes Music Store, where you could buy a song for 99 cents that could only be played on an iPod or Mac computer. The concept seemed sort of crazy at the time, but Apple’s entry into the digital music market would be the beginnings of a services business that’s now second only to iPhones in the company’s revenue stream. If you want to think of 2002 as the year Apple sulked its way through the end of the dot-com bubble bursting, you can think of 2004 as the year the iPod took over. That summer, Newsweek put Steve Jobs on its cover, and Duke University gave new iPods to all incoming freshman. Apple also released the iPod Photo with a color screen that some might consider an early sign that the company would one day create a do-everything mobile device. Three years later, Steve Jobs announced the iPhone as “a widescreen iPod with touch controls,” a “revolutionary mobile phone” and “a breakthrough Internet communicator.” In other words, a new iPod that does a couple more fun things, including, eventually, the ability to buy apps on a mobile device. In the third quarter of last year alone, Apple generated $18.2 billion in revenue from app sales. To put that number into perspective, Tim Cook’s big warning to investors this week amounted to his announcing that Apple would bring in $84 billion in revenue this quarter instead of the projected $89 to $94 billion. So $5 billion short. Just as it was in 2002, the company is dealing with growing pains generated by a slowing global economy and a slowdown in hardware sales. This time around, Apple’s bad numbers are just bigger. The other big difference, of course, is that Apple seems to be lacking in the “amazing new products in development” category Steve Jobs mentioned back in 2002. It’s remarkable how the years that followed Apple’s last panic were marked by profound growth and innovation. The iPod’s legendary run would pale in comparison to the explosion of change sparked by the iPhone’s release, not to mention the steady success of the MacBook Air, the iPad, and the Apple Watch. And yes, the Services business is making a lot of money, too. Maybe that’s just it, though. Maybe this present day Apple panic is just bookending a profound moment in history when one company could do no wrong. Maybe Apple’s heyday of invention and innovation are behind it, and now the company has to find a future in streaming video services, artificially intelligent voice assistants, and augmented reality software. Apple’s recent hiring habits would suggest as much. Some of these pursuits are bound to be profitable, and Apple’s next quarter will probably be less embarrassing than this one. The company’s fans, especially those that remember Steve Jobs on stage in 2002, must also be wondering: When’s Apple going to make us gasp again?